We all went to work about the same time, so it just seemed that — and you had to be in by 10. So you had to be on the base by six, I think. You could have company for the dances. But it was al open air, too. We didn’t have windows, it was just screens. It was Hawaii. You know they talk about the bugs now. And maybe mice or rats. And I don’t remember any of that at all. At all. 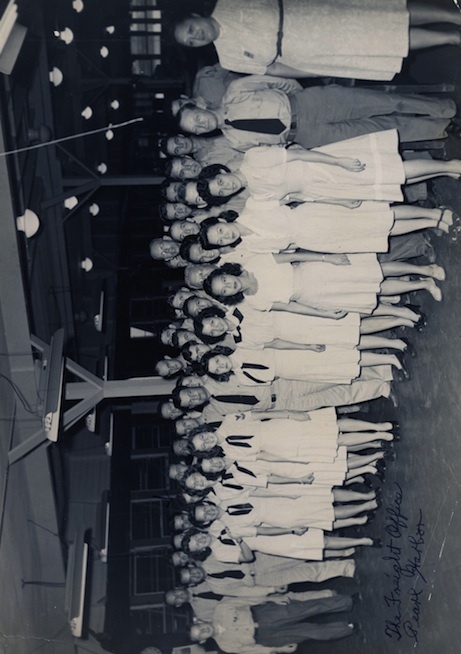 This photograph shows Merrily and her co-workers in Hawaii during World War II. It comes from the collection of Merrily Kurtz Hewett.